The Moreton House is a two bedroom beach house best suited to one or two couples. It has a clean, modern feel, and is decorated with contemporary Australian art. With its expansive front deck, back verandah and open plan living space, the house is designed for leisurely living no matter the weather. The northern orientation ensures plenty of light and air flow, and being low set, two sets of stacking sliders is all that separates you from the native garden with its spectacular paperbarks. The Moreton House, situated in the township of Kooringal, is a minutes' walk from the pristine waters of Days Gutter, the only all-weather anchorage on Moreton Island. Days Gutter is home to turtles, dolphins and dugong. The island is 98 per cent national park with miles of empty beaches, freshwater perched lakes, magnificent walks and drives, whale watching in season, and good fishing, squidding and crabbing. Or you can do as little as you please in the plentiful comforts of the house. Moreton is 37km long and 10km at its widest point, so the size of Moreton makes exploration easy. Mount Tempest, at 280 m high is the highest sand dune in the world. The Quandamooka people are the traditional owners of Moreton Island. As there are no sealed roads on Moreton, you'll need a 4x4 to access the island. Fully screened; plumbed barbecue; stereo/MP3 player; digital TV with DVD player; fireplace - if you wish to use the fireplace, you'll need to bring your own timber - hardwood only; ceiling fans to bedrooms; modern cook top and oven; large fridge/freezer; full complement of cutlery, crockery and cookware; a large shower cubicle; wardrobe space; solar power; two high quality queen size beds; a choice of pillows; garden lights. Linen is not supplied. There is no laundry. As the Moreton House runs entirely on solar, you won't be able to use a blow dryer, curling wand or any appliance that generates heat, as you would flatten the battery. Large shower stall and vanity unit with separate toilet. Dining area with four chairs. Exterior dining table on front verandah. The Moreton House is quiet, peaceful & had everything we needed for a great weekend away. We had a wonderful weekend at The Moreton House, Kooringal. The barge was cancelled due to the cyclone weather conditions & we had to change our weekend. Tom went out of his way to help. The house is well situated, well equiped & also lovely & clean. We would highly recommend this property, hopefully we will get another opportunity to go back. Thank you Tom. Great house, great location, great time! We had a great time at The Moreton House over the Australia Day long weekend. The house is modern, clean, and has everything you need. 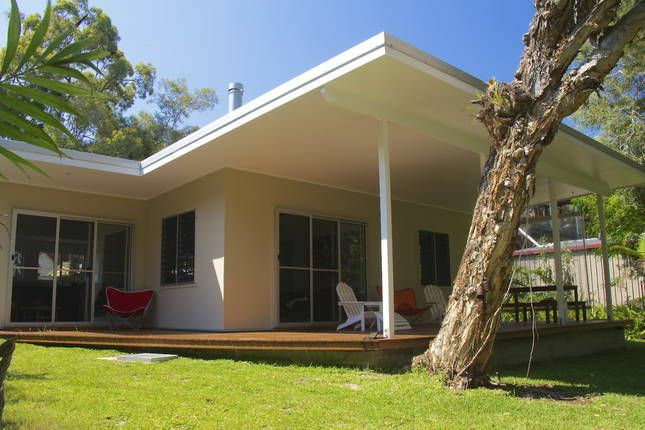 Highly recommend this property for a stay at Moreton Island. This property is a great holiday house. Very peaceful and quiet location, the front deck is cool and relaxing. Love the garden lights. We will be back. We stayed here for a week over Christmas-New Year with our two children. The house was in a perfect location, close walk to the beach and The Gutter bar. We haven’t been to Moreton for over 20years and we were amazed how nothing has changed. We love the Kooringal end of Moreton where the house is located as it is more relaxed and you feel like a local. The Moreton house was the perfect size for our family or would suit 2 couples well. The house was very clean and well equipped. The house was bright and airy and we particularly liked the modern decor. Our only suggestion would be a fan in the main living area. And perhaps access to a hose to wash car down at the end of the day. All in all we had a great stay and will be back. I spent five days over the Christmas period at The Moreton House with my family and we enjoyed it so much. I can't recommend this house enough!!! We were so impressed with relaxing vibes when we walked into the house. It was very peaceful, the house was extremely clean, well equipped and beautifully designed. It was so lovely of the cleaner to leave a fresh bunch of herbs for cooking with a lovely note. We didn't feel like leaving the house. Luckily we took a lot of insect repellent as at this time of a year there was lots of mozzies and sand flies so we could comfortably enjoy our time in the beautiful front yard. We would love to come back to The Moreton House in a future.